Hubert Soreau is not from Champagne and like many outsiders who have found their way into traditional, European viticultural regions (ref. Tony Bodenstein at Prager, Michi Moosbrugger at Schloss Gobelsburg, Ted Lemon at Dujac), he is making waves. He is part of the single vintage, single parcel, single barrel approach currently utilized by a handful of growers in the region, but he also brings to his work a perspective unencumbered by traditions and conventions. Le Clos l’Abbé is a single parcel outside of Epernay where the Vallée de la Marne and the Côte des Blancs meet. This parcel was originally planted in the 9th Century after the Bishop of Reims ordered it cleared for viticulture. At that time, it was known as Mons Ebbonis and afterward, as Mont de Bon in the 14-17th Centuries when the parcel was predominately planted to red grapes. The Counts of Epernay then purchased the parcel in the 17th Century from the Bishop of Reims, had to build an Abbey on the site in addition to paying remunerations, and it has been used for Champagne production ever since. Hubert was born in the far north of France, in the town of Maubeuge, on the border of Belgium. His family moved to Champagne, in a house across from Le Clos l’Abbé, where the site essentially served as his back yard. His parents were able to purchase a small parcel in 1993 and Hubert added to that original holding with another purchase in 2003. He never uses pesticides or herbicides and he picks late in the season with an average ripeness of 11° Baumé. Fermentation takes place in both used barriques and neutral 300L Hautvillers oak barrels and is finished with minimal dosage. 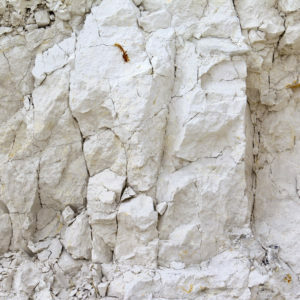 At the surface, Cretaceous Chalk is very fragile and it weathers to dust which can easily be blown or washed away unless, as in the case of Champagne it is saved by Tertiary material which binds with the chalk to give it structure so that it doesn’t disintegrate. There are tiny fractures in the chalk which were caused by frosts during the Ice Age, and similar to the vines in the Mosel Valley in Germany, the vine roots can descend 30 meters into these fractures to tap the moisture supply below. This porous aspect of Cretaceous Chalk keeps the vines from suffering drought, because the average precipitation is only 26 inches per year in Champagne—near minimum for grape growing. The chalk in Champagne is also called Belimnite which is named after the Belimnite mollusk which lived in the Paris Basin. Belimnite chalk covers all of Champagne with the exception of the Aube, which is Kimmeridgean. There are tiny fractures in the Cretaceous Chalk which were caused by frosts during the Ice Age, and similar to the vines in the Mosel Valley in Germany, the vine roots can descend 30 meters into these fractures to tap the moisture supply below. This porous aspect keeps the vines from suffering drought, because the average precipitation is only 26 inches per year in Champagne—near minimum for grape growing.